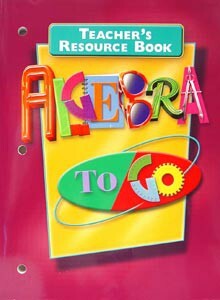 Algebra to Go Teacher's Resource Book by Great Source. The ideal companion to Algebra To Go: A Mathematics Handbook (#1408), this resource book provides guidelines and support to help you use the student handbook as an effective teaching tool. Introduce, reinforce, and review important math topics with activities, investigations, extensions, practice tests, and assessment rubrics. Softcover, 223 pages.